This concert will be the seventh concert on the choir's 51st annual concert tour, and will feature 17 teenaged ringers playing more than 150 handbells and handchimes. The 2016 concert includes the music of John Philip Sousa, noted handbell arrangers Betty Garree, Kevin McChesney, and Fred Gramman, as well as exciting selections from the 2015 Christmas season. Admission to the concert is free, and a free will offering will be collected. We are still in need of 3 more volunteers to house the bell ringers/chaperones. There are 2 sets boys remaining and one female chaperone. Please see Brian Burns if you are able to help. Thank you!! In 1963, The Wesley Bell Ringers, a music ministry of Christ United Methodist Church in Salt Lake City, UT, began with 9 youth ringers and 25 bells. From the very beginning, though, it was expected that if you wanted to participate you would be dedicated to the group, commit to play handbells to the best of your ability, and most importantly, to caring for, and about, the other members of the group. Fast forward 53 years! The 17 current ringers are the most recent of the 472 youth who have participated in the choir. The experiences have never changed. They provided a foundation to which were added traditions, awards and travel. The choir developed a reputation for musical excellence that continues to open doors to exciting opportunities. The previous 50 summer tours have taken the choir to all 50 states and most of the Canadian provinces. They have performed at the US Capitol, Cathedral of the Pines National Monument, Mt. Rushmore, Disneyland, and Disneyworld. The choir has participated, as the featured choir, at numerous handbell festivals around the United States, and performed for The National Music Educators convention. Performances with The Mormon Tabernacle Choir and The Utah Symphony Orchestra have been repeated honors over the choir's history. The ladies got to show us their favorite hats on Mother's Day, so now it's your turn gentlemen! All men and boys are invited to wear their favorite tie or bow-tie or even their ugliest, most creative, or funniest ties to Sunday Morning Worship at Calvary on Father's Day. 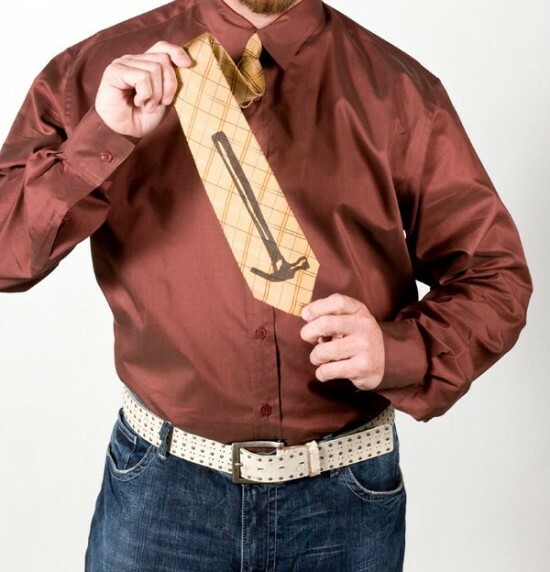 Time to show off the best ties that you have received over the years! 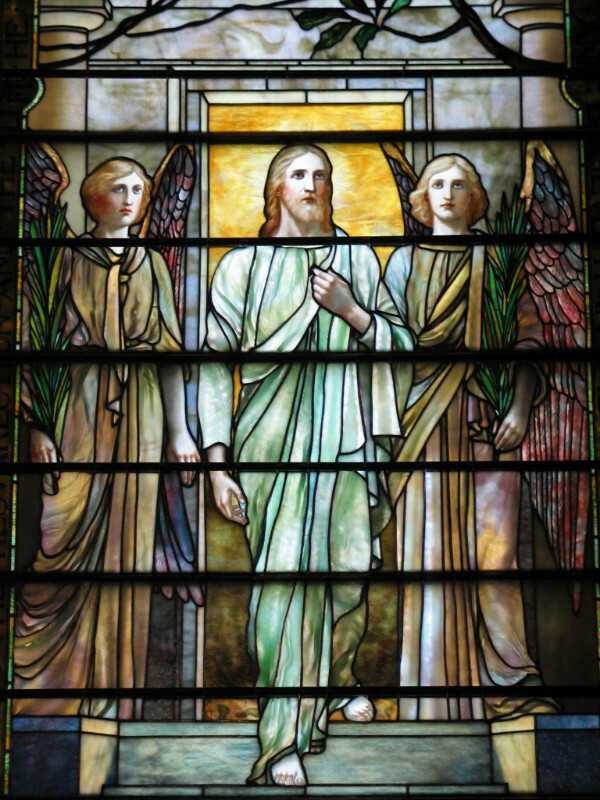 Please join us as we view the Tiffany windows in the height of their glory during the Summer Solstice. The evening will be accompanied by chamber music featuring Calvary's Music Director Brian Burns on our historic "Farrand & Votey" pipe organ. This event is sponsored by the Calvary United Methodist Women. Louis Comfort Tiffany changed the physics of making stained glass in America by re-creating the medieval techniques of using solid stained glass instead of painting on glass to create glass designs. He added additional techniques of twisting the glass to get new colors, throwing confetti made of glass onto molten glass, and sandwiching up to five pieces of glass behind each other in a single composition. And here in the North Side of Pittsburgh, we have Tiffany's three largest windows executed between 1894-95. The subject matter for his windows was chosen by Calvary Methodist Church patrons, but the design was done by the artist. Women in his shops made most of his windows.The Resurrection window is on the northwest side of the church. At the summer solstice, light through the magnificent window is at its peak during the year. Due to the physics of refraction, Tiffany's layered glass changes colors only when the sun comes through at unique angles, such as on Solstice. The Resurrection window has everything - layered glass, confetti glass in the dappled tree leaves, streamer glass, and drapery glass as well as the three panels being a "time-lapse" of events on the day of the resurrection. The Jesus figure, which for most of the year is walking out of an Allegheny Cemetery-like mausoleum, appears suspended on a cross of gold which extends down the steps and transforms the Roman soldiers from blue armor to silver and gold. In the other sun-swept window of the Parousia, the angels wings seem to flutter as they change colors before your eyes. 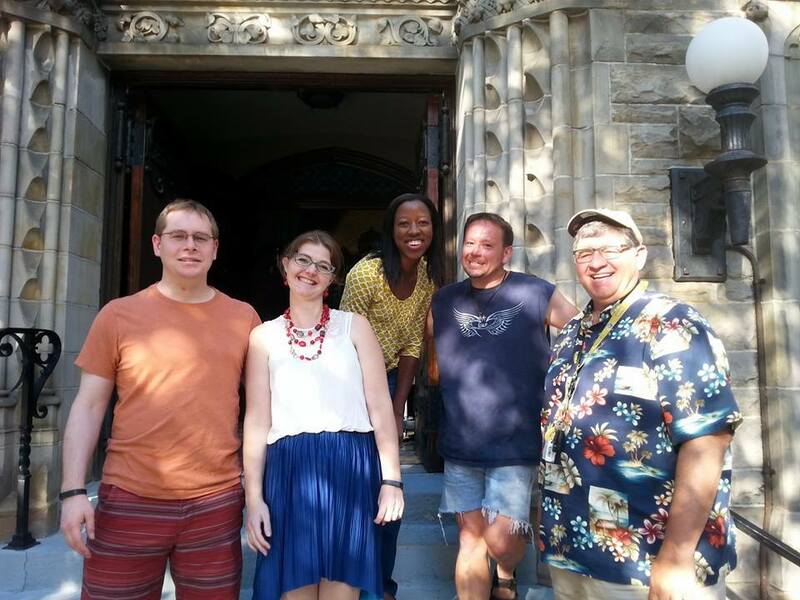 Our doors will be open again this year on July 4th so that Calvary friends and members may welcome fireworks-goers and Allegheny West neighbors to come by for some refreshments and to visit the Tiffany sanctuary. The open house the last two years was a tremendous success. It was a great day spending time with friends and meeting new people. We are looking for a person that would like to chair this event. In the past Brian Burns has been in charge of the event, but this year he will be unable to do so. Please see Brian Burns if you would like to chair this event. He will be able to give you all of the information that you need to know. For the complete story, please visit the Calvary Website. For more details about this program, please visit the Calvary Website. We are in need of sponsors for upcoming months. 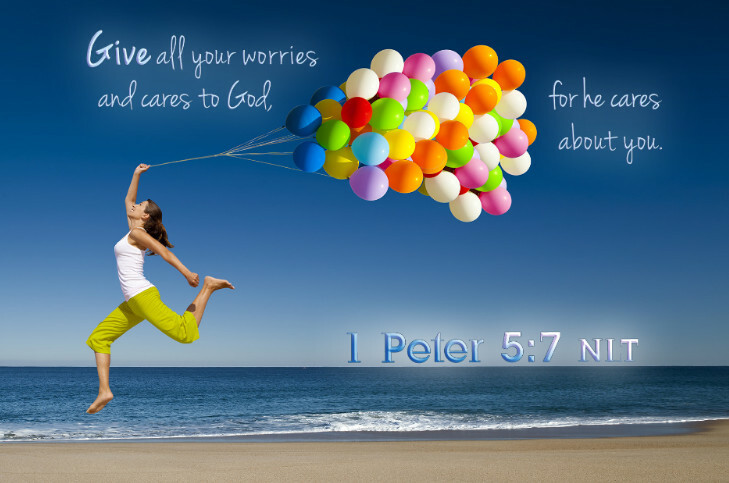 The Calvary UMC E-Newsletter is distributed twice a month. The first, more detailed, newsletter is sent out at the beginning of each month. The second newsletter is sent out around the middle of the month and contains only the Church Calendar so that you can stay current on everything that is happening at Calvary. For more information about this Small Group, please visit the Calvary Website. Brandon Morgan – back pain. Circle of Faith is... A public witness to welcome and inclusion for LGBTQIA persons, their families and allies by varied faith communities. For all who believe God’s love is inclusive and that all are welcome into the “family circle” that their faith communities offer. Please save the date of June 5th for an hour or so in the afternoon as we hope you can join the growing number of representatives from diverse faith communities who take part. Please join us under the tent at Schenley Plaza, across the street from the Cathedral of Learning. Calvary sponsors The Daily Bread at New Hope every 2nd Thursday of each and every month. If you are interested in helping physically or financially please let us know. It can be a group project or an individual donation of time; we are always looking for help. If you are interested in helping please contact the church office. Father's Day - Ties & Bow-Ties! 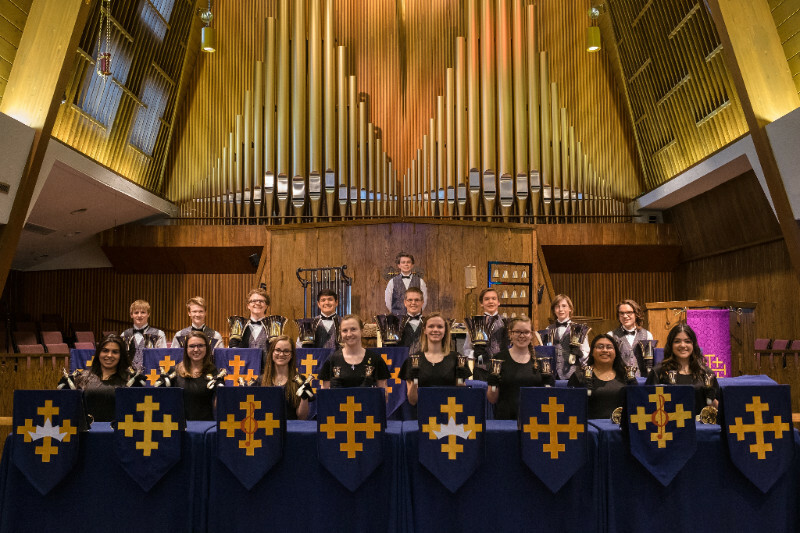 The concert will be the seventh concert on the choir’s 51st annual concert tour, and will feature 17 teenaged ringers playing more than 150 handbells and handchimes. The 2016 concert includes the music of John Philip Sousa, noted handbell arrangers Betty Garree, Kevin McChesney, and Fred Gramman, as well as exciting selections from the 2015 Christmas season. Admission to the concert is free, and a free will offering will be collected. Please join us as we view the Tiffany windows in the height of their glory during the Summer Solstice. The evening will be accompanied by chamber music featuring Calvary's Music Director Brian Burns on our historic "Farrand & Votey" pipe organ. This event is sponsored by the Calvary United Methodist Women. More details to come over the upcoming weeks. Everyone is welcome at this new annual tradition at Calvary! The evening begins with a turkey dinner with all the trimmings including pumpkin pie. After dinner there are crafts and games that everyone can participate in. It is always a wonderful evening of great fellowship and fun! All are invited to raise their voices together in a classic holiday choral work during the 6th Annual Handel's Messiah Sing-Along at Calvary United Methodist Church on Saturday, December 3rd at 4:00pm. The performance is a community "sing-along," with professional soloists, an orchestra, and an amateur chorus. The annual concert started five years ago out of a desire to provide the Northside community with a sing-along rendition of Handel's most beloved work, "Messiah". The sing-along was founded on a principle of openness - everyone is welcome in the choir, and everyone is welcome in the performance. As an audience member you are not required to sing, but you are certainly invited to sing. This holiday tradition now brings up to 400 people to Calvary UMC to sing selected choruses including the famous "Hallelujah Chorus". Audience members are asked to bring 1-pound non-perishable food items for the pantry at Northside Common Ministries. In addition, we ask you to bring reusable tote-bags (you know, those give-away totes we all collect for grocery shopping, etc.) These are needed for those who use the pantry and are, of course, better for God's earth than plastic bags. Cookie reception with the artists follows in the Victorian Chapel. It's a fantastic way to kick off the holiday season, and we invite everyone to join and sing for the joy of it! Children of all ages are invited to a Christmas Party following Fellowship after morning worship. Join us for a fun-filled afternoon featuring a visit from Santa, Christmas crafts, games, and snacks! Building Entrance — The main entrance during office hours is in the rear of the building via Dounton Way. This is also the location of the handicapped entrance. If the door is locked please press the call button on the left hand side. A member of church staff will let you in.